Infants are free of charge as long as they are accompanied by parents. However, an additional fee is required during special events. This garden is accessible to wheelchairs (however up to the second floor in the building). * Rental wheelchairs are available here. Please let us know if you want to borrow a wheelchair because there are limited numbers. In principle, only about 100 people can enter the La CASTA Natural Healing Garden each day and advance reservations are required so that all visitors can stroll through the garden at a leisurely pace while enjoying temporary comfort and healing. In addition, please note in advance that large groups of visitors (more than 15 people) are not permitted due to the nature of the garden. No animals, food, and beverages. The entire garden is non-smoking. We have a cafe but serve no food in the garden. Visitors who have consumed alcohol may be refused entry. Please refrain from taking photos and videos or using such photos/videos for any purpose other than souvenirs of your visit to the garden. You may be guided to our previous factory if you search for the garden using the telephone number on a car navigation system. 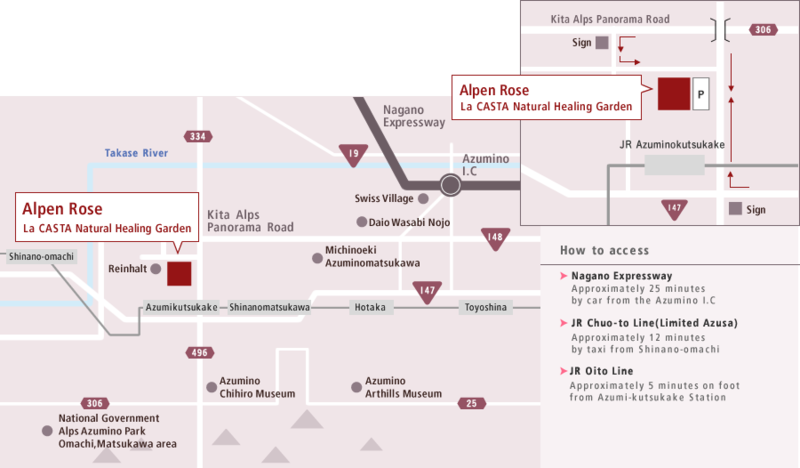 In such cases, please search for JR Azumi-kutsukake Station and head east about 300 meters from the station.